Employers need to do more to address the needs of staff who are diagnosed with cancer, a charity has warned. Around 90,000 people of working age are diagnosed with cancer every year. Many leave the workforce not because of the severity of their cancer, but because there is a crucial lack of practical policies, information and support, CancerBacup said. 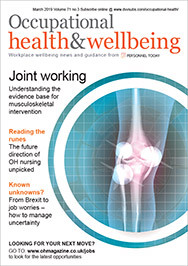 Less than half of the 330 respondents surveyed by the charity were offered flexible working arrangements or work adjustment policies; more than a third had not been offered a return-to-work meeting; and less than one in five had been offered information about managing cancer at work. The report, Work and Cancer: How cancer affects working lives, highlights the negative impact of cancer on employment patterns and on financial stability. Nearly a third (31%) of cancer patients do not return to work after cancer treatment, and nearly two-thirds (61%) experience financial difficulties. Four out of 10 (41%) say their overall working life had deteriorated. More than a third (37%) of respondents said their career prospects had deteriorated, and a quarter (25%) feared disclosing their cancer to a new employer. Almost a third had lost confidence in their ability to do their job. Joanne Rule, chief executive of CancerBacup, said: “There is a culture of ignorance among employers about the true needs of employees with cancer. Organisations must make sure they understand their obligations under the Disability Discrimination Act, Rule said. They should be aware that most cancer patients are soon likely to be protected from discrimination from diagnosis and they should communicate this to all staff, she explained.